I originally developed the first of these PT boat plans to build my own Elco PT-109 similar to the 1:32 scale Lindberg plastic kit I had as a teenager. As I posted the plans and my build log on this site, I received requests for a larger version, and the 1:24 scale version was developed. Both these plans are available for purchase below. These first two plans have become quite popular and I have received many helpful comments and ideas (please, keep them coming - use the contact form). Again, as a result of your feedback, I have added a gigantic 1:16 scale version of this plan. Read more about it here. 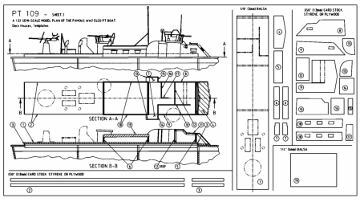 PT boat model boat plans. 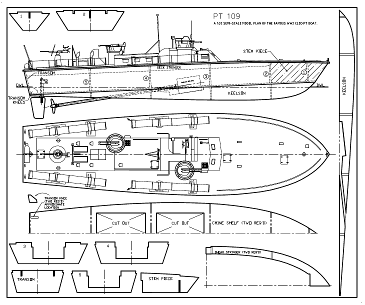 This is the first sheet with hull templates and GA.
PT boat model boat plans - sheet 2, with deck house layout and templates. Part One: PT 109 RC model - Background & build kick-off. Part Two: Assemble PT 109 hull structure. Part Three: Planking the Elco PT-boat hull. Part Four: Adding hatch coaming and deck to the PT-109 model. Part Five: Sealing the hull with Tissue and Dope. Part Six: Building the Deck Houses. Part Seven: Building the MG turrets. The PT boat I'm building is at 1:32 scale - the same as the famous Lindberg kit of the PT-109. The build log and plans have been popular with visitors to this site and I've received requests for a larger, dual-motor option. Both these plans consist of two sheets. The first sheet show the General arrangements and all templates to finish the hull. The second sheet show the deck house layout and the templates to build them. The plans show a lot of detail, without being intimidating, and could produce a truly handsome boat. The two plan sets are available in a single zip file. Order below. 1:32 and 1:24 scale in a single zip file. Skill Level: Intermediate. The plan is intended for balsa construction and should not pose too big a task for someone with a couple of simpler boats under their belt. Balsa is inexpensive, light and require a minimal set of tools to build. Millions and millions of balsa models have been built on kitchen tables around the globe in the last 100 years. The hull can be sealed using the age-old tissue-and-dope or fiberglass/epoxy. Finished, the RC PT boat will measure about 30 inches long and eight inches wide (760 by 200mm) and weigh about three pounds (1.5kg). The PC PT boat plan is intended for a single Mabuchi RS-540 RC motor, or similar for simplicity and good economy. I see no reason a brushless motor could not be used if you'd want to. Skill Level: Intermediate. I don't perceive the larger boat to be much harder than the smaller to build, but will cost a little more in materials. It will handle better, but require more water to maneuver and thrive. For this plan, I'd recommend using any mix of materials: balsa, plywood or basswood - whichever you prefer. A balsa hull will definitely be the lightest and potentially fastest, but the least durable. The other options require more tools but can take more abuse etc. This boat would do best being sealed with fiberglass and epoxy, although tissue-and-dope would still work quite well. The 1:24 PT boat will measure about 40 inches long by 10 1/2 wide (1000mm x 267mm) and weigh just under eight pounds (3.5kg). The larger PC PT boat plan is intended for a dual Mabuchi RS-540-type RC motor setup. Alternatively, a single 600-size motor could be used with a single propeller. For a single-motor setup, I'd consider up-sizing and centering the rudder for better control. Again, a single or a pair of brushless motors could be used if that's within your budget.